Don’t you just love implied headlines?! If you were thinking that you would hear about some lavish Vegas mega resort being opened and then closing soon after, you’d be wrong, but that doesn’t make this story any less true. In fact, Las Vegas did just see another one of its gambling halls demise into the blowing sands of the desert, but which one? There was no name, there was no alcohol and there wasn’t even a building. At its height, the casino brought in $3 from two patrons and paid out zero in returns. Its most historic hour was probably around 11am when the $2 bet was placed at a video poker machine. Tensions ran high as the cards were dealt and after the hand was lost, the outlook seemed promising for this little outfit. One could even speculate that this casino would rage on for many more hours, but alas, the doors officially closed at 2pm, citing low revenues. It appears that Marriott International bought a 14.4 acre plot of land just off Las Vegas Boulevard back in 2006 for $225 million with plans to build some sort of “real” casino or resort. After the recession hit, all plans were put on hold. This plot of land is currently zoned for unrestricted gaming and Marriott doesn’t plan on losing this zoning any time soon. County law states that as long as active gaming takes place on the land for at least one full shift every 18 months, the zoning designation will not expire. What to do? What to do? That’s right…put up a temporary casino! 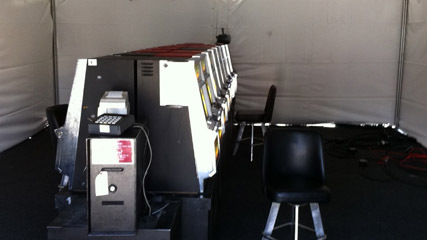 Although in past years, this temporary casino has been held in trailers, thus earning its nickname the Trailer Station, this year’s was held in a tent—a cold, dark one at that. Apparently when Walter Jones opened the casino at 6am, the electrician responsible for the lighting and heat hadn’t even showed up. Rather than deal with the crisp morning air, Jones decided to wait it out in his car. Once the casino got swingin’, Jones and his bosses were actually hoping that nobody played so the paperwork would be minimal. There’s no telling how much it actually cost Marriott to hire United Coin to setup the tent, but it’s a sure bet that they’ll be back in 18 months to keep things in check. Las Vegas is in a serious slump with the nation’s highest unemployment rates and home foreclosures. It’s amazing to think that anyone would want to start construction on a new casino or mega resort given the lack of business. I guess that’s why this little plot of land will probably remain just that for 10 or more years. It’s going to be interesting to see what Vegas even looks like in 10 years.